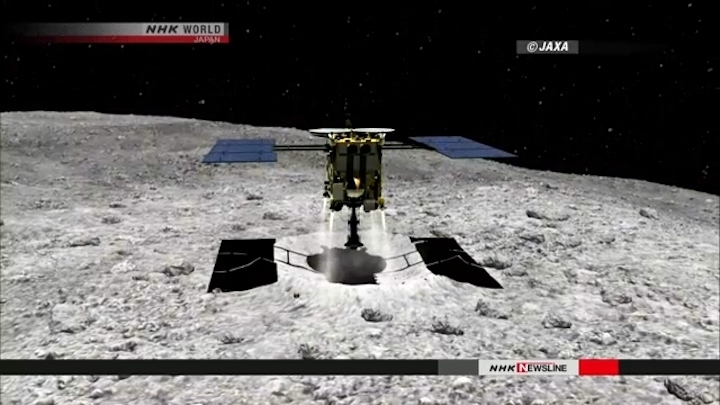 US space agency NASA says it will seek advice from Japan's Hayabusa2 project team on how to land a probe on the rocky surface of an asteroid. NASA is planning to land a probe called the OSIRIS-REx on the asteroid Bennu, which was more than 120 million kilometers from Earth as of December. The probe has been observing the asteroid from a distance of about 1 kilometer since December. NASA says Bennu is covered with more boulders than expected and appears not to have any flat sites with a 25-meter radius needed for a safe landing. The OSIRIS-REx project team says it will try to find a relatively flat space on the asteroid. The team will visit the Hayabusa2 project team at the Japan Aerospace Exploration Agency, or JAXA, next month to get some advice. The NASA team says it hopes to gather dirt and gravel on Bennu as planned in July 2020. The team also says it has observed Bennu ejecting particles and rocks measuring up to several dozen centimeters in diameter from its surface. NASA says it will analyze the components. Water has been detected on Bennu.